1. To prepare vinaigrette: In small bowl, combine shallots with vinegar and 1/2 tsp (2 mL) salt. Let sit for 5 minutes to combine flavors. Add mustard and mix well. Slowly whisk in canola oil. Once canola oil has been incorporated, add tarragon and parsley. Set aside. 2. To prepare artichokes: In large pot, combine 2 cups (500 mL) water with orange zest, peppercorns, bay leaf, thyme, tarragon and 1/2 tsp (2 mL) salt and bring to a boil over high heat. 3. Set steamer basket on pot and arrange artichokes in basket. Reduce heat to a simmer and steam until artichokes are tender and pull away easily, about 45 minutes. 4. 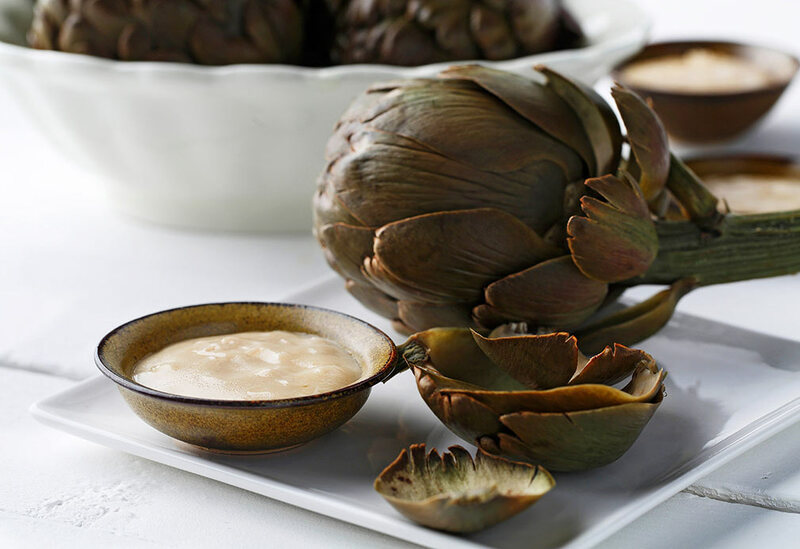 Serve artichokes hot or at room temperature with Mustard Tarragon Vinaigrette.